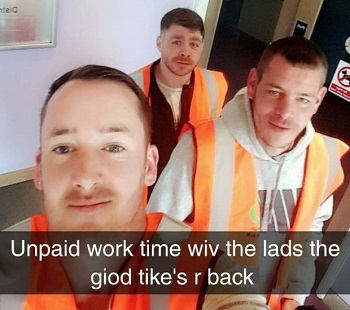 Three men were pictured having a whale of their time during their community service – but the courts have had the last laugh. 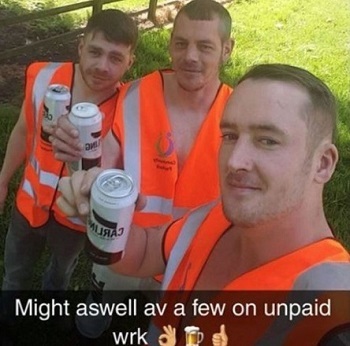 Lee Snowden, Chris Bader and Matthew Fisher took selfies of themselves drinking cans of Carling during their community payback, the new name for the punishment. But the selfies sparked an investigation, and the three criminals were found to have breached their community orders. The trio from Bradford in West Yorkshire will be re-sentenced and could face jail time. The photos were taken when they should have been cutting hedges and trimming the lawn at Thompson Court Nursing Home in Bingley. 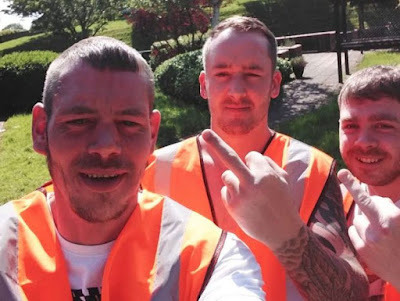 Other pictures posted on Facebook showed them sticking their middle fingers up at the camera and looking at their phones. It is not known why the men were serving the punishment. Mark Burns-Williamson, West Yorkshire’s Police and Crime Commissioner, said the ‘behaviour is clearly not what we would want or expect to see from anyone completing community payback’. The courts are expected to deal with the men within four weeks, but this may take longer if there is a backlog of cases. A spokesman for the West Yorkshire Community Rehabilitation Company said: ‘The investigation has been concluded.